Unit1Can you play the guitar? 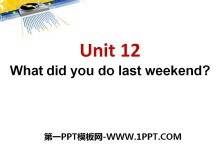 Unit2What time do you go to school? Unit3How do you get to school? Unit5Why do you like pandas? Unit8Is there a post office near here? Unit9What does he look like? 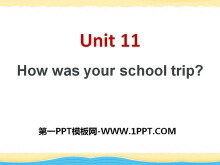 Unit11How was your school trip? 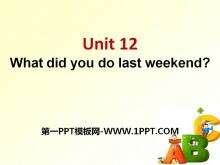 Unit12What did you do last weekend? 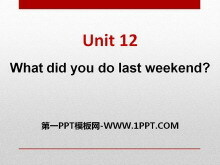 《What did you do last weekend?》PPT课件10 一、单项选择 (20小题，共20分) ( ) 1._______ ! The tree is falling down. You can choose another way. ( 2013. 贵州) A. Look for B. 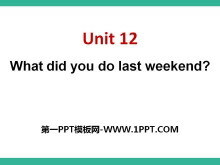 Look after C. Look out D. Look up ( ) ..
《What did you do last weekend?》PPT课件9 学 习 重 点 学 习 目 标 【学习重点】 阅读有关文章并将目标语言、短语及句型运用到写作中。 【学习目标】 学会写一篇记述过去发生的事件的文章 写 前 指 导 Monday December 7th ..
《What did you do last weekend?》PPT课件8 学 习 重 点 单词: high ago India tent moon surprise snake scared move start jump wakeinto forest ear. 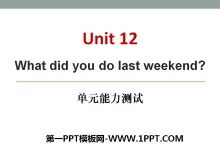 拓展：surprise/ surprised/ surprising get/be a surprise 短语: high..
《What did you do last weekend?》PPT课件7 学 习 重 点 1.单词: awaymouse(mice)baby（babies） shout languagefly(flew) kite woof 2.短语：run away shout at fly a kite 3. 语言目标: ① ---What did you/he/she/they do..
《What did you do last weekend?》PPT课件6 学 习 重 点 单词: camp lake beach badminton sheep as natural butterfly visitor tired stay 短语: stay up late go camping do homework see a movie go boating go to the bea..
《How was your school trip?》PPT课件12 一、单项选择 (20小题，共20分) ( ) 1. --- How was your last summer vacation? --- ________________. A. Thank you very much B. Good idea. 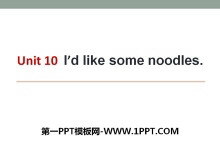 C. It is great. 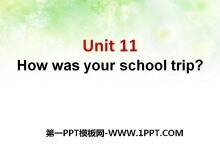 D. It was really gre..
《How was your school trip?》PPT课件11 写 前 指 导 My names Cindy. I had a pleasant day last month. In the morning I got up late and then began to do my homework. It took me about two hours to finish it. 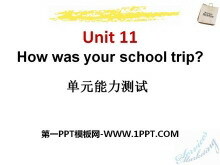 Then I..
《How was your school trip?》PPT课件10 学 习 重 点 单词: cheap slow robot exciting lovely expensive fast guide gift everything dark hear 短语: all in all be interested in not at all along the way teach sb. 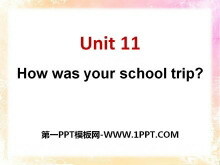 to d..
《How was your school trip?》PPT课件9 学 习 重 点 单词: yesterday flower worry luckily sun museum fire painting 短语: come out take photos go fishing fire station have fun draw pictures 句型: 1. 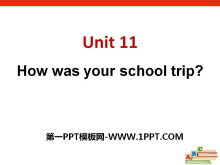 Were the strawb..
《How was your school trip?》PPT课件8 学 习 重 点 单词: milk cow horse feed farmer quite anything grow farm pick excellent countryside 短语: ride a horse milk a cow feed chickens quite a lot(of) in the countrys..
《Id like some noodles》PPT课件12 一、单项选择 (20小题，共20分) ( ) 1. People in America eat much ____. A. potatoes B. onions C. beef D. hamburgers ( ) 2. 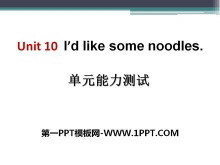 There ____ two glasses of water and some chikchen on th..
《Id like some noodles》PPT课件11 学 习 重 点 学 习 目 标 【学习重点】 阅读有关文章并将目标语言、短语及句型运用到写作中。 【学习目标】 学会为餐厅写一则广告 阅读下面美文完成写作框架 Uncle Wangs Noodle House Welc..